The S.C. Department of Natural Resources will conduct an annual Baltimore Oriole Winter Survey Feb. 12-15 in conjunction with the Great Backyard Bird Count. The state natural resources agency is interested in the status and distribution of these colorful songbirds that have begun wintering in the Palmetto State. You can participate in the survey by either requesting a S.C. Department of Natural Resources (DNR) survey form or if you are a Great Backyard Bird Count participant, you can e-mail a copy of your checklist submission. Contact Lex Glover at GloverL@dnr.sc.gov or call (803) 603-6461 to get more information. Baltimore orioles usually winter in South and Central America and historically it was unusual to see one in South Carolina during the winter. However, during the last few decades, they have been wintering along the East Coast and Southeast in greater abundance. Last year's Great Backyard Bird Count results had sightings ranging from New York to Florida and over to Louisiana. South Carolina Baltimore Oriole Winter Survey data combined with the Great Backyard Bird Count data, had S.C. with the highest number of reports (30 percent) and the highest number of orioles tallied (38 percent). South Carolina had orioles as far inland as Greenville and along the coastal plain, from Myrtle Beach to Walterboro. Though DNR is not sure why these birds have begun overwintering in the state, we do know they are responding well to the popularity of backyard bird feeding. Orioles by nature have a "sweet tooth" and will eat nectar from flowers and wild fruits. Their favorite bird feeding food seems to be by far grape jelly. 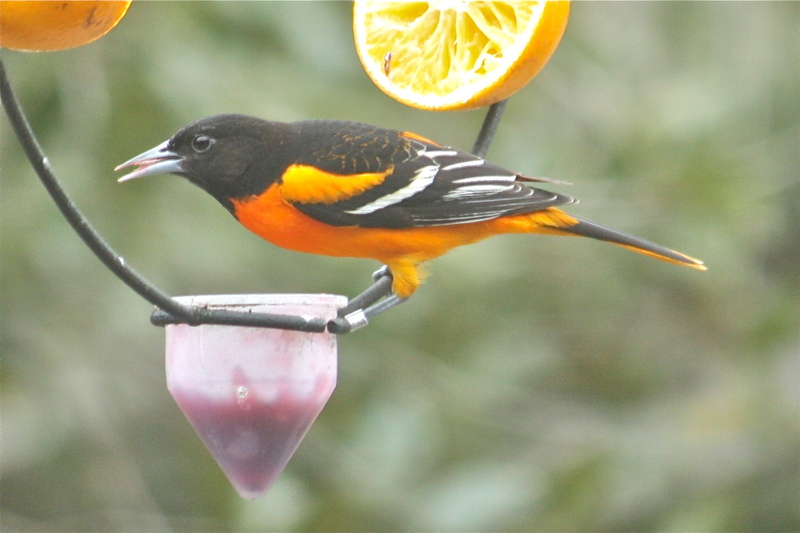 Orange halves can be used to attract the orioles into your yard, but grape jelly will encourage them to continue returning. Other items they will eat are suet products (homemade, cakes, bark butter, logs, etc. ), sugar water (they will drink from hummingbird or oriole nectar feeders), seed mixes (seem to prefer nut and fruit mixes), sliced grapes, mealworms (live or freeze dried), sweet cornbread and pound cake. With the popularity of orioles joining the backyard bird feeding, there are now a variety of feeders available to offer them food. As with any feeder you purchase or use for feeding birds, make sure it is easy to clean (feeders should be cleaned regularly), keeps food protected from the weather and allows easy access for the birds. During the winters from 2009-2015, DNR trapped and banded Baltimore orioles that frequented feeders around the state. DNR trapped a total of 1,148 birds at 41 sites; banding 990 and recapturing 158, representing 142 individuals. The numbers of orioles frequenting the feeders was larger than originally thought, sometimes twice or three times more. But the most exciting find was when one of the orioles banded on March 8, 2011, in Myrtle Beach, was recovered on Sept. 23, 2015, in British Columbia. This is at the extreme western edge of orioles' known breeding range. DNR has stopped the banding efforts for now but wishes to continue monitoring orioles through this survey. The survey will enable scientists to learn distribution and abundance of Baltimore orioles wintering in South Carolina. Information from the survey and Great Backyard Bird Count can provide a "big picture" about what is happening to Baltimore oriole populations. DNR appreciates the public's support and efforts with helping collect the valuable information in the survey.